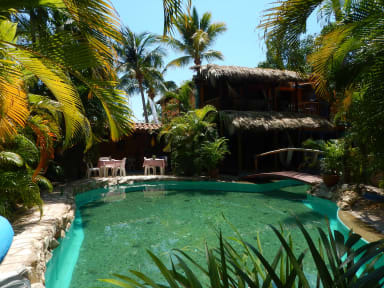 Tower Bridge Hostel i Puerto Escondido, Mexiko : Boka nu! We are not in the very touristy zone of Puerto Escondido, but have a lot of exciting and reasonably priced activities to offer. If you are looking for the authentic Puerto Escondido you will find it here! The area is very quiet and safe at night. Our location is right between the city center and Puerto Escondido’s only three safe swimming beaches. Playa Carizalillo, Playa Coral and Playa Manzanillo can be reached in 12-20 minute walks from the hostel. Playa Carizalillo is suited also well for surfers at beginners and advanced levels, we are happy to help you with board rentals and surf lessons. The romantic bay is as well the perfect spot for swimming and snorkeling. It’s perfect for anybody who's after a relaxed Mexican beach atmosphere with crystal clear water and nice little local food places. For the convenience of our guests we offer a free daily shuttle service to these three beaches at 11 am. You can rent snorkel equipment at the hostel. The local Benito Juarez Market with its lively Mexican atmosphere is just 850 meters (10 minutes) up the road. It offers authentic Mexican food and freshly made juices as well as flowers, handicrafts and souvenirs. The perfect shopping place for people on a small budget or on self-catering holidays! Around the hostel there’s a variety of very good cheap restaurants, cafés and taco places (5 for 30 pesos!). The prices are significantly lower than on the touristy Zicatela beach. The hostel's goal is to provide an environment where people from all over the world can get together, have a great time and share their travel experiences. Therefore the hostel is designed to be a social meeting point and offers a wide variety of amenities for your entertainment. These include a large barbeque area, games area with pool table, foosball table and a wheel of fortune at the bar. Our poolside bar serves hand shaken cocktails for a backpacker's budget. The property is completely landscaped including a large free form swimming pool surrounded by a rock garden and colorful native tropical trees and plants, which all adds to the feel of Oaxaca, México. WiFi is free of charge and of course available in all rooms. All lockers are equipped with power sockets. Extras provided: free WiFi, free outside parking, locker boxes with sockets for charging phones in the dormitories, bar, public kitchen, breakfast buffet (50 pesos), towels, linen, different tours available. Please note that we can clean your room daily if you like. Please ask for this service, as we cannot offer it automatically. Check in at 2pm, check out at 11am. Great hostel! Super friendly owners and staff and good vibe. Would've stayed longer but unfortunately I'm on a short time schedule. Would definitely recommend this hostel to anyone! I think I had a bit too high expectations for this hostel for its high ratings and also because the price was not the cheapest either (but we were also there in the beginning of Semana Santa so it’s understandable) The hostel is rated high because the atmosphere is good and staff very nice. But otherwise the hostel is very basic, not that clean, and location is not great. This is just my personal opinion because of my preference, so depending on your demands it might still be a good option.